But there was one advert I discussed that could be lesson to all brand managers. Anyone remember the Shake n’ Vac television advert from the 80s? It was in the shops from 1979, but due to a strike by ITV, the advertising campaign wasn’t aired until 1980. 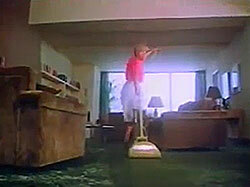 The ad featured a woman (actress Jenny Logan) dancing around, shaking the carpet freshener powder all over the carpet. It was regarded by advertising commentators as one of the tackiest commercials ever to be aired and gave it the thumbs down, but the public voted it one of the best adverts to be shown in Britain. In fact, the ad came 18th in Channel 4’s The 100 Greatest TV Adverts programme in 2000. You can watch the ad here. Trouble was, despite massive publicity, comedy show parodies and a ton of media PR, the product was a resounding flop. Oh dear, you mean that wonderful jingle everyone was singing failed to move the product off the shelves? Afraid so. Just like countless other products and services that fail miserably. To be honest, I don’t know exactly why the product didn’t sell. Some would suggest that the idea of a woman prancing around as she did the housework was sexist. 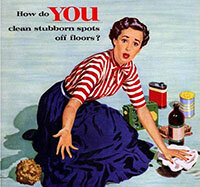 Well, let’s face it, the ad was a bit reminiscent of this one from the 1950s. But I don’t think that was the real reason for its failure. In my book I explain that a brand does not create a market. A brand gives you the most powerful weapon available to address the market – one that is already in existence, or one that your data have shown you is emerging and in which there will be sufficient buyers to establish a profitable business. If there is a definite market, are you sure you can you create a sustainable demand for your proposed offering? Have you paid attention to the shifting dynamics of society, culture and important trends that will have a significant effect on the businesses of tomorrow? I did some work with Polaroid, the instant camera people, many years ago. In the 1970s, being able to take a picture and have it emerge, fully developed, straight out of the camera, was something quite innovative. But I also consulted for a film processing company, and by the mid-1980s, its high-street processing outlets were offering a one-hour turnaround on film processing from standard 35mm cameras. They eventually withered and died. Today, of course, digital cameras and smartphones not only take high quality pictures but can be e-mailed across the globe in minutes. Little wonder that Polaroid filed for bankruptcy in 2001. Interestingly, the manufacturers of Shake n’ Vac, S. C. Johnson & Son, relaunched it in 2010 under its Glade brand, and did a revised ad, morphing the original ad into the new one. It still featured Jenny Logan, by now a little older (you can watch it here). As of 10 days ago, Shake n’ Vac is still getting positive reviews on their website. So who knows, maybe the time is right, the product is right…and the brand is right. Okay, here’s the 10-minute radio phone-in interview. Happy listening.